Crisis, tragedies and disasters have very particular characteristics of uncertainty and require different relationships and responsibilities for their response and solution, with extremely difficult decision making. The philosopher Naomi Zack (2009) – one of the main references on disaster ethics – clarifies that there are aspects of these events that go beyond the obvious facts, being seen in obligations, values ​​and choices in which emotions and challenges of the same existence coexist, and conflict (Tavares & Barbosa, 2014). Although there are scholars who shy away from moral discussions linked to disaster events based on the premise that they are not caused by moral agents (Murray, 2011), Zack (2009) argues they are related to well-being and the reasons for what people have a general moral obligation not to harm others and to help those who suffer or need. Considering Zack’s argument, the astonishing rescue of the twelve boys and their football coach who were trapped in a cave in Thailand for seventeen days is a recent case in which ethical elements were constantly present: in the actions of adolescents, technical staff, divers, those responsible for coordinating the operation and public authorities involved. According to Zack (2009), the proper preparation of operations, such as that carried out in Thailand, is “mandatory prudence”. Similarly, lack of preparedness is seen as a moral issue in the field of disaster ethics, that is, a “failure of mandatory prudence”. Still within this field, Jenson (1997) believes that different moral dilemmas may arise when managers are faced with questions such as: How should ethical decisions be taken? What principles and values ​​should guide those involved in ethical processes during tragedies? What is responsible action in response to human needs? In the case of the Thai boys, the rescue co-ordination team initially planned to rescue the strongest boys first. This option would be due to the very complexity of the operation that had never been carried out and so that the weakest could be strengthened and face the challenge that was to come. 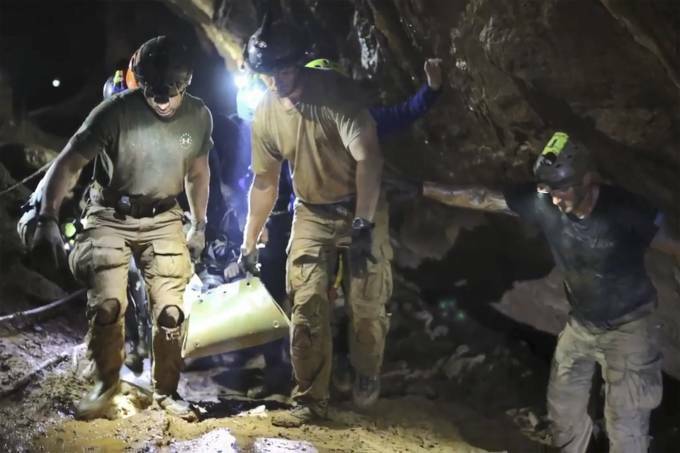 However, an Australian doctor and diver was called to the cave and the strategy was reversed to rescue the weakest first, as the rain forecast seemed to confirm, and the rescue could be hampered. Reflecting on this decision, in addition to the technical aspects, also a moral dilemma, especially to those who are not usually accustomed to working in tragedies: must be rescued those that need medical assistance more urgently, but could not resist the rescue operation due to the weakness and complexity of the action OR should be rescued those that are more physically and healthily able to withstand the difficulties of an operation never performed and to survive while the weak are strengthened? Putting the question in this way and showing the pros and cons of both alternatives may make the understanding of the situation clearer. However, how are the families of those boys who had to wait a day or two more to be rescued? According to the BBC website (2018), there is a Thai saying: “You will avoid offending those who help you by asking for more than they can give you.” With this conviction, another ethical deliberation, probably based on the community culture, was not to divulge the names of the first ones rescued. “Pressuring the authorities at a time like this could be considered ungrateful, disrespectful and even at risk” (BBC, 2018). In addition, Narongsak Osottanakorn, head of the rescue team, explained that identities were not revealed out of respect for the families of the boys who remained in the cave. Thus, the celebration of a family would not cause anguish to those still waiting for news (BBC, 2018). This case shows us that, as important as considering aspects that are essentially of a technical nature, it is to understand that the complexity of its management develops insofar as it faces conflicts or requires deliberations based on human and subjective factors, such as ethical deliberation. It reinforces the importance of the subject and discussion of the ethics of disasters, be they natural or not, in the present day. BBC. Resgate na Tailândia: Por que identidade de crianças salvas demorou a ser revelada até para os pais? Available in: . Acess in: 10 ago. 2018. JENSON E. Disaster Management Ethics. UNDP Disaster Management Training Programme, 1997. Disponível em: . Acesso em 10 ago. 2018. TAVARES, L. M. B.; BARBOSA, F. C. Reflexões sobre a emoção do medo e suas implicações nas ações de Defesa Civil. Ambiente e Sociedade, São Paulo, v. 17, n. 4, p. 17-34, 2014. ZACK, N. Ethics for Disaster. Lanham, MD: Rowman & Littlefield, 2009.